Army veterans continue to protest demanding OROP or One Rank One Pension scheme implementation at the earliest but the government continues to delay. What is causing the delay? 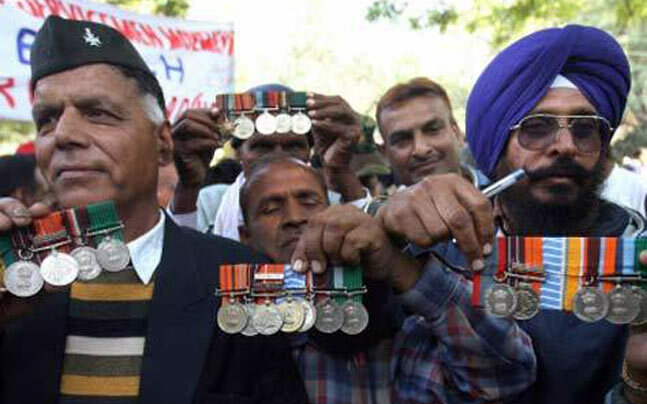 Even if the government immediately implements the OROP scheme, will it be a logical move? What are the arguments in favor and against OROP? In this article, we will find out the answers of these questions that is bothering not just our armed forces but also the national citizens who depend on the soldiers for safety and security. So, what is One Rank One Pension Scheme? India maintains a vast army in land, air and water. However, our country needs army personnel to be young. Thus, the soldiers need to retire at an early age, facilitating the recruitment of new jawans. Indian soldiers stay employed until they reach the age of 35 years, after which retirement is mandatory. Only a handful of soldiers make it beyond that age and stay employed till 54 years of age at the maximum. Compared to this, civilians with government jobs retire at the age of 60. Because of early retirement, Indian soldiers fail to get multiple salary increments and often, their services end without earning any promotion. To compensate for this, Indian government pays higher pensions to retired soldiers. The problem is that the amount of pension to be paid is determined by Central Pay Commission and is dependent on the last drawn salary. This is where the problem came up. A Colonel for example, who retired after 3rd Pay Commission decided the pension amount will continue to get the same pension but another soldier at the rank of a Colonel who retires after the 6th Pay Commission decided the pension will get a higher pension than the other person. Why? Because it is universally accepted that salary increases every year to adjust for market corrections and inflation. Thus, a soldier who retired recently will have higher last drawn salary than a soldier who retire 10 years back. Hence, the soldier who retired recently will have higher pension than the other person. Thus, soldiers of same rank get different pensions only because they retired at different points in time. This is where the army veterans disagree. They are demanding that pension should be uniform for a particular rank irrespective of the time of retirement. Putting in simple words, army veterans are demanding that a Colonel (can be any other rank) who retired earlier should be eligible for the same pension amount as a Colonel who retired recently. This is One Rank One Pension! Indian economy is growing over years. Growth always comes at a cost of steady inflation. Inflationary spikes are covered through salary increment (usually known as market correction increments). Over years, salary of government employees (including armed forces) increase. The percentage of increase is determined by Central Pay Commission. Recent Pay Commissions offer more benefits to government employees compared to older Pay Commissions. Government employees (other than army personnel) get a chance to enjoy salary increments for many years and they also get a chance to earn promotions because of their longer duration of service. Most government employees are eligible for pension (and that includes army personnel too). Pension is always based on last drawn salary. Army personnel, at the end of their service, get limited opportunities for re-employment. With those points in mind, army personnel who retire early need to live with lower pension and lower benefits even at the face of ever-increasing inflation. This is not acceptable and it is the nation’s obligation to provide them with enough pension so that they can live a comfortable live. This is where OROP makes sense. It is true that the demand for One Rank One Pension is very reasonable and logical. However, implementation of the scheme is not simple. The problems are administrative, legal and financial by nature. Finding records is a big problem. According to Defence Ministry, digging up records that are 25 years old is still possible but anything beyond that is not possible since those records are no longer available. Assuming that records are found, the task of reconciling those records for OROP implementation is a gargantuan task and a near administrative impossibility over a reasonable timeframe. Not to forget that families of soldiers who retired back in 1940s still get family pension and there are nearly 20 lakh such families that get pension. Legal Ministry states that if emoluments and pensions that are paid in today’s economy are passed on to soldiers (or their families) who retired from service more than 3 decades ago, it would lead to Constitutional discrimination through discrimination of service terms. Another problem is that two soldiers may serve in a particular rank for different timeframes. For example, a Colonel may stay in the rank for 4 years whereas another Colonel may stay in that rank for 10 years or more. In such a scenario, the person staying longer in a rank will be eligible for higher pension. Now if the pensions for both these soldiers are to be equated, it will pose a serious legal challenge. The Finance Ministry pointed out that if One Rank One Pension is implemented by taking account of 6th Central Pay Commission recommendations, the total one-time payout will be approximately ₹ 8,300 crores. Assuming that the OROP is implemented by overcoming the administrative and legal problems, what happens when the next Pay Commission rolls out its recommendations? The above stated figure will substantially increase to ensure that new pension rates are available to old pensioners. If the demands of army veterans are met, it is highly likely that police forces will also start making the same demands. This will lead to even more financial pressure. Finally, in 2004, many civilian government employees shifted to contributory pension scheme. Implementing OROP will simply mean that civilians can start demanding a roll back to fixed pension scheme and then come up demanding OROP. If this happens, the whole system will collapse. It is not that no corrective measures were implemented earlier. In fact, in 2009, ₹ 5,000 crores were spent by the government for bridging out the pension gap for retired army personnel as per recommendations of 6th Central Pay Commission. Jawans in Indian Armed Forces were the ones who benefited most out of that corrective measure. However, if OROP is implemented in current format, officers will enjoy high increments of anything between 10K and 20K while jawans will have to stay satiated with just a few hundred bucks (something between ₹ 525 and ₹ 1,720) of increment. This is not going to make things easy for the government because the jawans may end up dragging the issue to court, worsening the problem. Central government made it clear that it will not budge from its decision of implementing One Rank, One Pension scheme for ex-servicemen. Though petitioners moved to the Supreme Court against this scheme, highlighting clauses of Koshiyari Committee, central government said that ex-army personnel pension will depend on their last post. All candidates, working in the same post will receive uniform pension. The monetary amount will not depend on their retirement date. However, Supreme Court suggested that central authority needs to send an official reply to the petition, submitted in the court. It seems that One Rank, One Pension policy decision is here to stay as judiciary cannot compel the government to change this kind of decisions.